I LOVE IT, MY BEST FRIEND IS A DEDICATED BARD PLAYER AND THIS IS SOOOOO HIM!!! Reading this felt so Bard it kind of hurt. Nice. I like the themes on this one quite a bit. Sadly for those looking for new info hidden in these, that looks like straight up counter-performance, though. Something we were already aware of as available to Bards. Lem is Ringo? That explains a lot. The eyebrow waggle! Best somatic component ever! So, Lem joins the ranks of Iconics whose Iconic Encounter involves other Iconics- so far, it's him and Ezren- which isn't much of a shock- a lone bard is a decidedly odd duck. First instance of male harpies in planet Golarion, I suppose... Right? Anyway, now I might be tempted to play a bard if later on. There's one featured in one of the playtest adventures, but it seems to be a creative decision going forward with the new edition, yes. Aren't male Dryads a thing too now? I remember one showing up and being friendly with Lini and knowing Harsk in one of the comics. 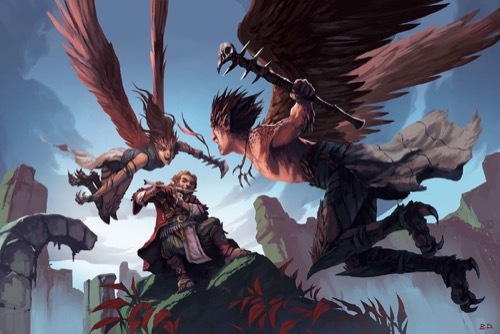 I kind of like that Fey and other monsters are becoming not tied to one gender...it also makes my homebrew connection between Harpies and Strix work better. I prefer the term "guyad"
(Also, yay for traditionally feminine monsters having male counterparts!!). And yay for countersong! You don't see it very often at the gaming table, but it's a TPK-saver on occasion. "Guyad" - heh. I think it was the late, great Terry Pratchett who had a dryad respond to the "I thought you were all female?" line with "Stupid. Where do you think acorns come from?" This was fantastic! The only bard I've played was more comedic than musical, so I could see parts of this happening for my party. There's also one (with art) in the Sandpoint book that recently came out. Oh, and props to Biagio d'Alessandro for the awesome illo!! Is Sutter writing prompted by the art in these pieces? The art can't be commissioned for these stories, right? An iconic encounter is probably something recurring, so I'm guessing the art is commissioned and will be used often. And based on this one and the Amiri art, I'm completely okay with that. I'm hoping these stories and the art form part of the "Introduction to the Class" in the PF2 rulebook. I'm not just reading an RPG rulebook for the rules. I want to be inspired. Their books usually have a big image with a small story attached at the start of each chapters, I wouldn't be surprised if they were used for that. Good on you Lem, if you've got it FLAUNT it ... heh heh heh .. don't get up anyone ... I'll see myself out .. It'd be cool if that's where we got the art, wouldn't it? "Oh come on! Seriously?! They don't even have lyrics! What about rhyme and meter? Clever wordplay?" I think Lem just became my favorite iconic. Yup! I actually get sent both the image Paizo's chosen and a rules element they want to showcase, so I have to figure out how to fit the one into the other. Sometimes it's fairly obvious or Mark will send me a suggestion, but other times there's a bit of a puzzle to solve before I can even start writing. Fortunately I usually find that constraints breed creativity! "Yeah. Writers working under tight restrictions produce novel material -like, for example, epigrams employing backwards alphabetisation"
It's pretty clear what the rule being showcased here is, but are you able to tell us what rule was being showcased in Ezren's story? Pretty sure it was the "Wizard Thesis" new thing.